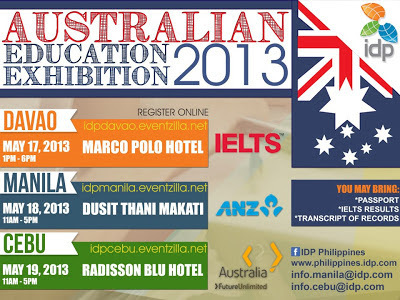 IDP Philippines offers rare opportunity to Filipinos by sponsoring the Australian Education Exhibition 2013 which will be held in Davao, Manila and Cebu respectively. IDP Philippines is the leading placement and support service for Filipinos aspire to gain international education. For 40 years, IDP has helped more than 300,000 students get education opportunities in prestigious colleges and schools all over the world. 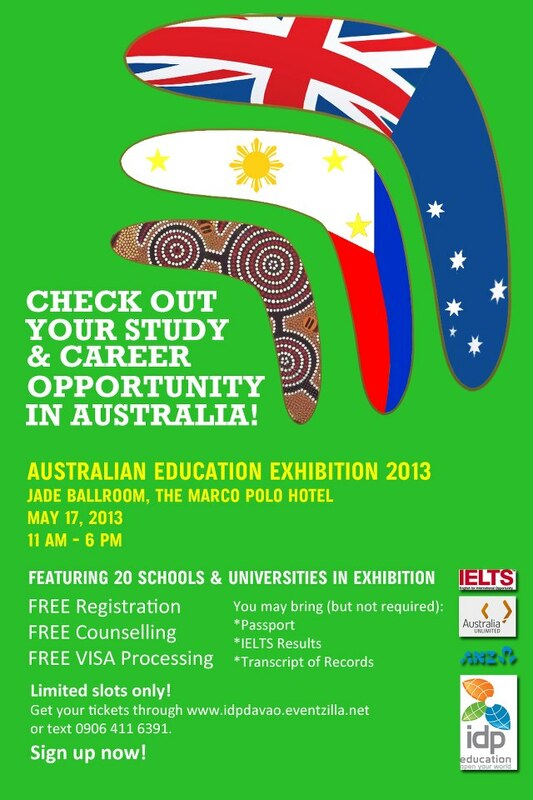 The first leg of the exhibit will be on May 17, 2013 at the Jade Ballroom of Marco Polo Hotel from 11AM – 6PM. 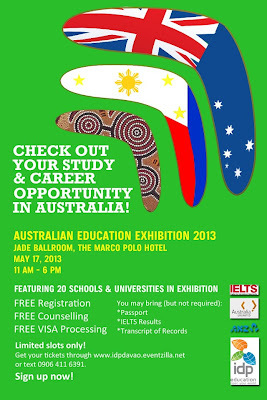 Representatives from 20 Australian Schools will be participating in the exhibit to showcase their programs and campus attractions. Le Cordon Bleu Australia Whitefriars College Inc. This is a one-day only event for Davaoenos on May 17 because they will be moving the exhibit to Manila on May 18 and Cebu on May 19, 2013. The entrance fee for the exhibit is FREE but you have to pre-register your slot for the event. You may drop by to the event anytime from 11AM – 6PM. IDP offers free counseling and free VISA processing to all the registrants. Only limited slots are available so make sure to register online and get your e-ticket to be admitted at the exhibit. 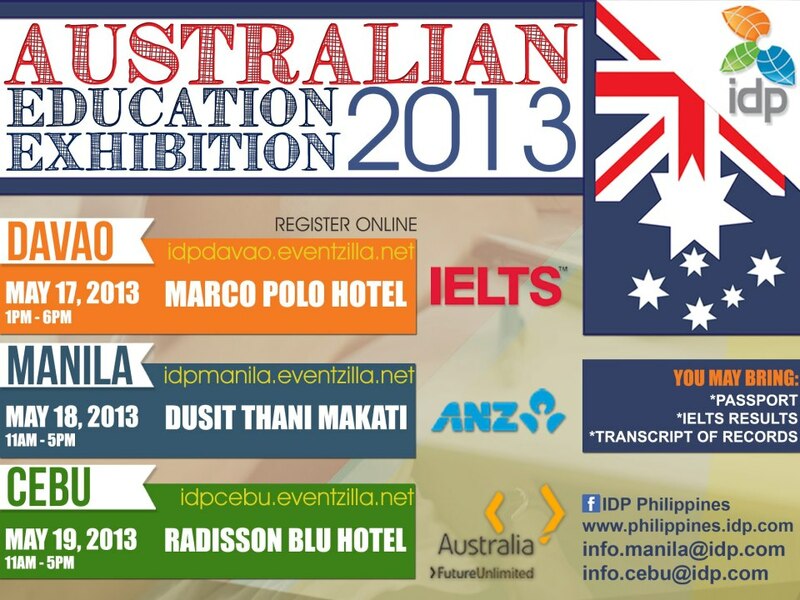 For more information, contact 0906 411 6391 or visit their event page “IDP Australian Education Exhibition 2013 – Davao” or LIKE their page on Facebook. It's nice that Australia is opening that kind of opportunity to the Philippines. if I were still there, I probably would grab the opportunity to attend, though I hope they also give out scholarships since i am not sure i would be willing to pay high tuition, haha. The problem here is the show money. Madugo yun. But for those really interested to try their luck, Go na. ..that would be awesome! wish I could join you in the event...:) hmmm it would be great to be able to study in Australia, wish my kids could someday avail of great education, but more than that, I want them to grow with values ingrained in them :) take care always sis! This is quite timely since many countries are now looking at educational achievements of potential employees as well as potential permanent residents. Australia is a good country. I hope that many will be qualified for such great opportunity. Studying in a foreign land, especially in the Land Down Under is one of my dream.. My long time dream! I hope I can pursue it in no time.